…begins at the far end of the world. Throughout the world of Geadhain, for mortals, Immortals, and Dreamers alike, the tides of war have ebbed and flowed for eons. For Morigan and Caenith and their courageous companions, that tide has become a tsunami as they continue their treacherous journey into the strange shifting land of Pandemonia—where they are near to discovering a mythic relic to use against the Black Queen. Meanwhile, the citizens of Eod and the surviving elements of Menos ready their shaky alliance in a last stand against Death and her ghoulish unliving hordes; while King Magnus, Queen Lila, and Erik abandon humanity’s last bastion and venture north into a hostile world scoured by shrieking blizzards and walls of ice en route to their own confrontation with the enraged spirit of Winter herself and a historic evil embodied by the monstrous Kinlords. Across sundry fantastical landscapes, familiar heroes are edging toward individual destinies that even the Sisters Three are unable to fully discern, as Fate continues to weave and reweave its murky tapestry. 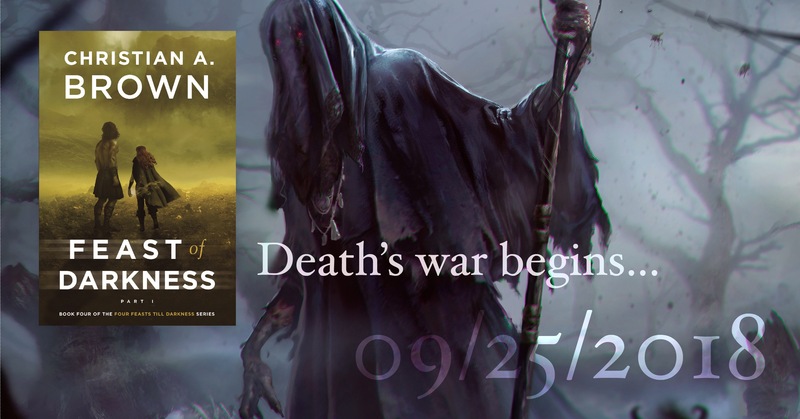 Nothing is certain except that should the Wolf and the Fawn fail in their looming apocalyptic clash with the mad king himself, all will be lost for the people of Geadhain. That’s the cover synopsis, and it should tell you what you’re in for: mayhem, wild twists, and the perseverance of love and hope in the face of unspeakable evils (the Kinlord and his minions are notably repugnant). The pre-release copies have all been sent, both print and digital versions finalized, and all is well and truly out of my hands…and soon in yours! I cannot wait to hear what you think of the latest instalment. P.S. As it’s been a while—and we all forget things—feel free to check out the new synopsis for Feast of Chaos.